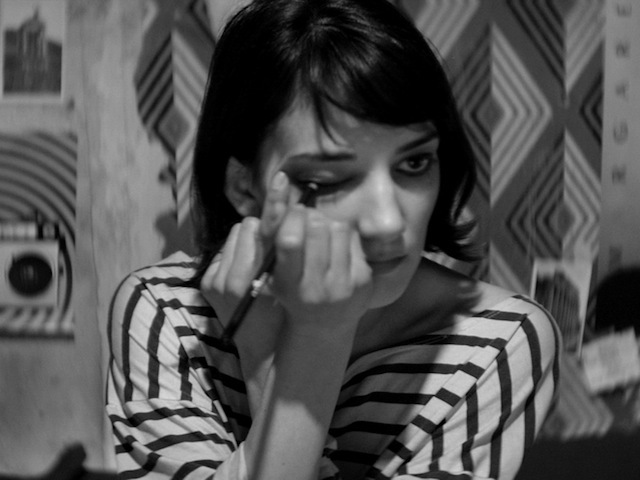 “A Girl Walks Home Alone at Night” has a killer logline: “Iranian feminist vampire film.” It’s true, the film takes place in the Iranian ghost town of Bad City, where mysterious a vampire credited only as The Girl (Sheila Vand) preys on men who prey on women. But the film spends as much time on Arash (Arash Marandi), a man dealing with his junkie father and the local drug lord, as he forms a romance with the Girl, and director Ana Lily Amarpour has been resistant to political or ideological analysis. What “A Girl Walks Home Alone at Night” is more than anything else is a striking, stylish debut. The film combines stark, dreamy black-and-white compositions of noir and early horror with the rhythms and affected cool of a Jim Jarmusch movie, not to mention other influences that include the Iranian New Wave, Werner Herzog and David Lynch. It’s very much the work of a new director trying to find her own voice amidst her influences, but the film has a unique melancholy power of its own, and it marks Amarpour as a director to watch. “AGWHAAN” is the sort of film that washes over you, yet it still heralds the arrival of a major star in Sheila Vand. As the Girl, she gives a quiet but deeply expressive performance. Somehow she is able to look exquisitely vulnerable and eerily sinister at the same time, which is quite a trick. Read more. By the film’s conclusion, after many arresting sequences and just as many that drag, emotion hasn’t built as effectively as it could if the film had been edited more mercilessly. But the same could be said of many works (debut features or otherwise) that proclaim an original new voice. I look forward to the blood-suckers, scoundrels and few down-on-their-luck decent souls Amirpour explores — and hones — in her next film. Read more. Amirpour fleshes out the somber life of the mysterious vampire woman, a doe-faced goth who wears a chic striped shirt visible beneath her burka. Though her origins remain obscured, as she trails various locals late at night, she quickly turns into the face of repression burdening all of them. When she traumatizes a neighborhood boy and threatens to watch his behavior for the rest of his life, it’s the first indication of a light at the end of the tunnel, a means of righting the wrongs in this broken world. Read more. Shot in the style of a graphic novel, Lyle Vincent’s gorgeously high-contrast, black and white cinematography highlights the surreal atmosphere of this Iranian vampire romance. Languidly paced and utterly devoid of tension, writer-director Ana Lily Amirpour’s A Girl Walks Home Alone at Night circumvents any kinship with the horror genre, relying quite heavily on its atmospheric mood to keep its audience transfixed. Read more. Writer/director Ana Lily Amirpour, who could have easily starred as the main character, is clearly inspired by comic books, with many of the scenes carrying a careful, graphic novel sense of composition. (Amirpour is also authoring a series of comic books that continue the story.) Each shot seems to be more beautiful than the last, with deep, dark blacks and blurry lens flares that were accomplished the old fashioned way: by shooting anamorphic. Read more.